Think about a Filet Slider Trio (filet mignon with caramelized onions, arugula, and crumbled blue cheese on a garlic-buttered and lightly-toasted brioche bun), or some Tuna Wonton Crisps (seared sesame seed crusted tuna on a bed of asian slaw and lightly-fried wonton crisps topped with wasabi mayo and spicy mustard) or the Blackened Mahi Mahi Trio (tender mahi mahi crusted in blackening spice, with jalapeno pepper jelly, and fresh cantaloupe on a lightly-toasted hawaiian roll). If you do want to think of England then order Fish and Chips (old bay seasoned beer-battered cod, served with fries, tartar sauce and malt vinegar). IPic Theaters (there are currently nine in the US) are as far removed from bog-standard cinema going as you can get. The one in Boca Raton has a cocktail bar and restaurant, a whole range of freshly made snacks to buy and take into the movie with you, and 8 theaters. And I’m not kidding about the laying back either. The Premium Plus seats at IPic are fully reclining with a footrest, a pillow and blanket, and a buzzer for waiter service. Oh yes, you get complimentary popcorn too. At $18 a piece, (about £12), if you register (free) as a member, I think that’s a pretty good deal. We watched 'Snow White and the Huntsman' which doesn’t exactly follow the traditional fairy tale: it’s more Snow White meets Robin Hood meets Joan of Arc, with a slice of Terry Gilliam’s Time Bandits slotted in. In short, (no dwarf pun intended) a real hunk of classy entertainment. 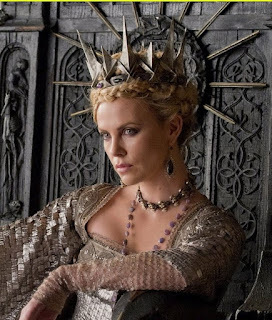 Top marks for the gorgeous Charlize Theron (Ravenna, the wicked queen), Chris Hemsworth (the Huntsman), Sam Spruell (Finn, the queen’s dastardly brother). And for the fairies too, even though they only prance through the movie for a matter of minutes. It’s the kind of CGI technology that can make you believe anything’s possible. Not quite so impressed with Kristen Stewart as Snow White… she didn’t crack the ‘Joan of Arc’ role for me. 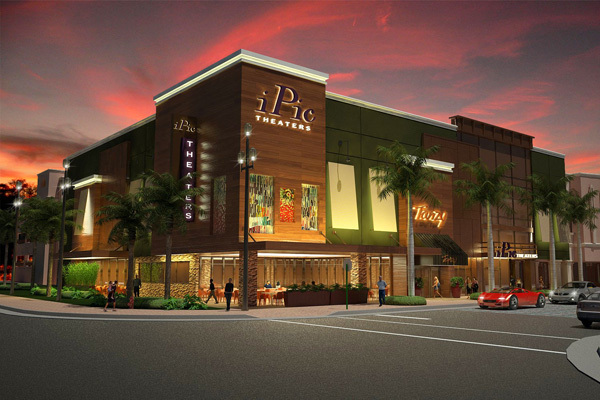 And IPic is calling me back. Mainly because I know it’ll be a long time until I experience anything like it again. 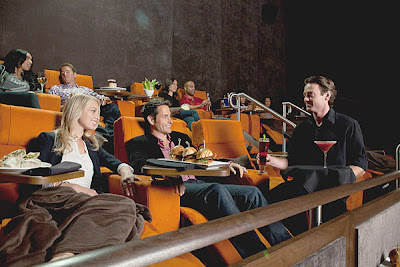 And because I want to go there feeling really hungry so I can fully indulge myself with the In-Theater menu. Did I tell you about the Chinois Chicken Salad Rolls (oven roasted chicken, napa cabbage, radicchio, and carrots tossed with sesame ginger dressing wrapped in rice paper), the Trio of Dips (a collection of house-made dips, roasted garlic hummus, artichoke aioli and olive tapenade, lightly-toasted and garlic-buttered pita), or the Street Tacos (bite-size soft corn tortillas with choice of grilled chicken or marinated steak, avocado cream sauce, chopped onions, cilantro and gremolata)? I almost don’t care what I watch. Write about laying back and thinking. Write about going to the movies. Write about a fairy tale that had an effect on you as a child. Write a fan letter to someone you like or admire. Write a dream or a fantasy that involves food.